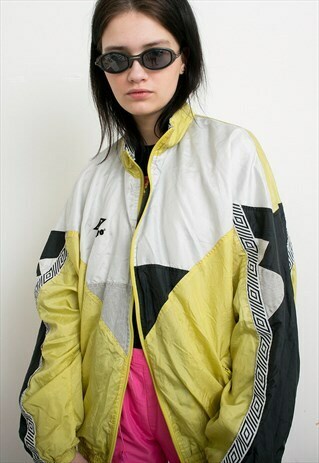 Vintage Umbro Logo Bright Sports Jacket Yellow Black White Geometric Pattern Unisex Jacket Urban Sportswear Zip Up Lightweight Festival 90s. Tag: Umbro. Measured lying flat: length from shoulder: 26 1/4'' / 67 cm armpit to armpit: 28 3/4'' / 73 cm sleeve length to armpit: 19 1/2" / 50 cm Material: Shell 100% Nylon, Lining 65% Polyester, 35% Cotton. Color: Yellow, black, white. Size tag on item: L. Approximate modern Size: L/XL. Model is 5.7 ft (172 cm), she usually wears size 34/36. Condition: the jacket has several small stains and the name of previous owner inside (ask for pictures), otherwise fine vintage condition.